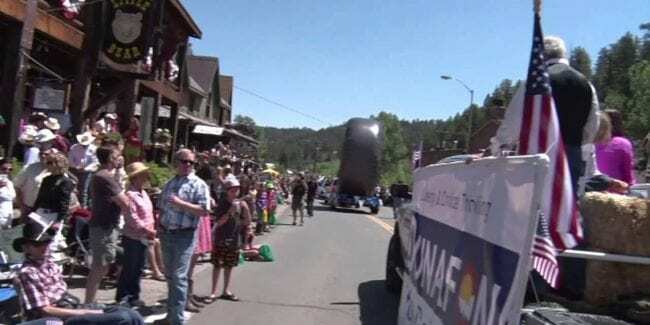 [Evergreen Rodeo Parade.] “A Colorado Mountain Tradition”, the Evergreen Rodeo is one of JeffCo’s can’t miss events for western flare. It’s a rain or shine event, with two days of live competition and events, including a parade on Saturday morning. The full two days of rodeo fun happens every summer on Father’s Day Weekend in Mid June. This year’s event is held at the El Pinal Rodeo Grounds from Saturday to Sunday, June 15th to 16th, 2019. It features a slew of fun activities for the whole family. The Pro Rodeo Cowboy Association (PRCA) event, sponsored by volunteer members of the Evergreen Rodeo Association plan year-round to deliver one of the top western rodeos in the state! Saturday morning’s parade through downtown Evergreen begins the old west festivities. They are followed by an event of rodeo shows, and more the next Sunday afternoon. Invite your kids for the annual mutton bustin’ competition.